When using Outlook 2003 via Citrix session, time zones in Outlook would not match the user session time via Citrix. Email would show the wrong received timestamps. However if you log on to the same server via Microsoft Remote Desktop (RDP) instead of via Citrix (ICA) the timestamps would be correct. 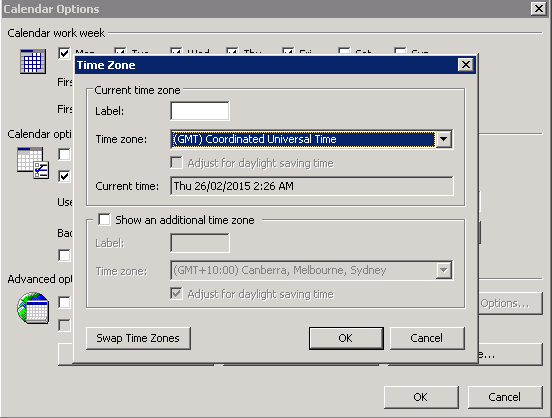 When going to Options > Calendar Options > Time Zones... Outlook would default to (GMT) Coordinated Universal Time. We found that registry for AppInit_DLLs registry entries for Citrix was missing. Specifically, the DLL references that provided the necessary hooks for Citrix to provide the time zone redirection of the client session. Since the office application was 32-bit, this meant that the reference for 32-bit applications for these required hooks weren't being applied despite what the Windows Server GPO was instructing or redirecting. This is the correct setting. MYOB PowerPay is old. Like... really old. The database engine behind this software was built in 1990 and is by a company called ACI which no longer exists. So expecting to run it on a modern operating system like Windows 8 is a high expectation. Originally I tried what everyone else would do and go straight for the Windows Compatibility settings. I tried everything and every version with no luck. However this is how I got it going on Windows Server 2012 R2 Remote Desktop Server, so this should also apply to Windows 8. "4D Engine has stopped working"
Go to the Start Screen and search for "Environment Variables"
Go to the Data Execution Prevention tab. Make sure DEP is set to On. Then click Add. Browse to where MYOB PowerPay is installed and select PowerPay.exe and click Open. MYOB PowerPay will now open. If this post helped you, please leave a comment below or even consider dropping a donation.